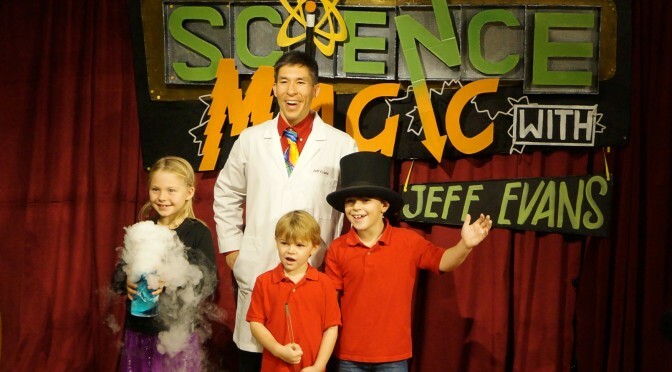 Jeff Evans presents Science Magic assemblies for elementary schools throughout the Pacific Northwest. These videos are great “try this at home” science demonstrations kids can do at home or in the classroom. Learn more about Jeff’s motivational-magic programs at www.edumazement.com. A colorful, classic science demonstration! Use your knowledge of density – and food coloring! – to “float” liquids on top of each other in a multi-colored rainbow display. Hot air expands and cold air contracts. A candle heats the air burning inside an inverted glass. When the oxygen trapped inside the glass is used up, the candle is extinguished . The hot air cools, contracts, and creates a vacuum which draws water up inside the glass. As fire is involved, have a responsible adult assist with this project. “Chop” a pencil in half using nothing more than a flimsy feather? No problem for a “black belt science magician”! This demonstration combines science (specifically, Newton’s 2nd Law of Motion) with magic (your index finger, not the feather, breaks the pencil!) in a visual spectacle people will talk about afterwards! Surface tension is a phenomenon in which the surface of a liquid, where the liquid is in contact with gas, acts like a thin elastic sheet. Explore how surface tension works by dropping pennies into a glass full of water until the water extends well over the lip of the glass without spilling. Float a paperclip on water using the properties of surface tension. Then, use soap to eliminate surface tension in a visually startling way. Challenge a friend to match lung power with you and inflate a balloon. Air pressure proves to be a formidable foe… until you slip in a little science magic. All you need are two plastic drink bottles, two balloons, a straw (optional), and something sharp enough to poke a small hole in the bottom of a plastic drink bottle. Harness the buoyancy of the carbonation in soda pop (7-Up, Sprite, etc.) to bring raisins to life, causing them to rise and fall in a glass. While you probably won’t fool anyone with this, it does look eerie seeing the raisins moving up and down apparently on their own! So simple, yet so unexpected! Grab a piece of paper, tape, and scissors and follow these simple steps. If you’re not familiar with the topological principal of Moebius Loops, the results will surprise you! “My friends laughed when I called myself a ‘human calculator,’ but their jaws dropped when my prediction of the sum of a random group of numbers proved to be exactly correct.” Learn this demonstration and you’ll have a fun party stunt you can do anywhere, anytime. All you need is a pen and piece of paper and the ability to do very basic addition and subtraction. Your friends will be amazed and your enemies petrified when you demonstrate your mental power to affect physical objects. Or, they’ll be impressed with your knowledge of expansion and contraction! You need a plastic drink bottle with a lid and boiling water to perform this demonstration. Adult supervision is required: be careful not to spill boiling water on yourself. Build your own miniature “motor boat” powered by… a drop of soap! Soap breaks the surface tension of water, and this propels the boat forward a short distance. This also demonstrates Isaac Newton’s 3rd Law of Motion; for every action there is an equal and opposite reaction. Challenge your friend: can they rescue an ice cube with a piece of string without getting their fingers wet or touching the ice cube or the glass of water in any way? You’ll need to understand the freezing point of water and how salt affects the temperature required for water to become ice. Three identical eggs placed into containers filled with mystery liquids behave differently; sinking to the bottom of one, floating in another, and remaining suspended in the middle of the third container. The answer is density. Which container has the liquid with the greatest density, and how do you know that? You’ll need a film canister with lid, a small amount of water, and an effervescent tablet (like an Alka-Seltzer) for this high-powered demonstration that uses a chemical reaction to demonstrate Newton’s Laws of Motion. Litmus paper is specially treated paper that, when dipped into a liquid, reveal whether the liquid is an acid or a base. You can make your own chemical indicator using the juice from a red cabbage! Create your own carbon dioxide “fire extinguisher” using just vinegar and baking soda (sodium bicarbonate). A small votive or other candle completes the demonstration so you can see for yourself that the invisible carbon dioxide gas exists and extinguishes a flame. Be sure and have a responsible adult nearby when using fire. Boldly announce to everyone within earshot, “Guess what? I can hypnotize… catsup!” Expansion and contraction and the resulting change in buoyancy is the hidden science at work here. You’ll amaze yourself when you create your own “lava lamp” in your kitchen! This is a “twofer”, or two-for-one: harness your knowledge of air pressure and liquid density in this fun science demonstration. What’s the difference between a science experiment and a science demonstration? In order to be classified as an experiment, you need to follow the scientific method. The scientific method is a way to ask and answer scientific questions by making observations and doing experiments. While the science demonstrations here are fun to watch and do, you can’t duplicate them verbatim for your school science fair project. However, by asking the right question, forming a hypothesis, and following the rest of the Scientific Process you can transform a fun demo into a great experiment. Slow gravity down with your knowledge of Lenz’ Law and eddy currents. When you see this in real life, it literally looks like you’re watching a movie special effect! This demonstration of center of mass shows how a high pivot point makes it easier to balance items. Two versions are included, and chances good you can do this with items you already have with you the next time you’re at the dining table. Whether you call it “anti-gravity water” or a “water suspension”, the secret here is air pressure. You’ll need a glass of water and a laminated postcard a little larger than the mouth of the glass. Try this outside or over a sink, as it doesn’t work 100% of the time! The premise: a playing card sits over the mouth of a glass with a golf ball resting on top. A piece of string is attached to the playing card which in turn is attached to the cork on a bottle. A chemical reaction of vinegar and baking soda creates carbon dioxide gas inside the bottle. With enough pressure, the cork pops off and flies through the air. What happens next is a great demonstration of Isaac Newton’s Laws of Motion! Jeff, great job on you vids. I kill the vid. With the baking soda and vinegar mixture to pull the card from under the golf ball! Let me know when you have the CD. People are always asking me for some experiments on CD, I may be able to sell some for you. Hi Frank! Thanks for checking out the videos and the feedback. I lost my password for the website and am just now receiving your message. Unfortunately doing the DVD authoring has me stumped and I never completed the project. If and when I do, I’ll be sure and send you a copy. See you at PCAM next week.